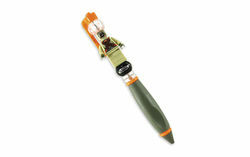 2851135 Tusken Raider Pen is a Star Wars pen released in 2009. This is a description taken from LEGO.com. Please do not modify it. Write anywhere -- even in the desert sands of Tatooine! This Tusken Raider is on your side -- and on your pen! Choose from a variety of unique pieces to assemble and reassemble your LEGO Star Wars pen in any configuration you can imagine. Facts about "2851135 Tusken Raider Pen"
This page was last edited on 9 January 2016, at 06:39.